On February 23rd, Mommy, Papa, and I left in an airplane for Vlissingen. It was a long ride. I slept only 1/2 hour—I like to challenge Mommy and Papa to keep me entertained. When we got to Vlissingen (a 2 1/2-hour drive after the plane landed), we all took a 2-hour nap, which was good, but I had trouble sleeping and napping for the next five days. In fact, the first night, I woke up at 2:15, and then again at 4:00, and Papa took me for a starlit car tour of Vlissingen while Mommy slept! For the first four nights we stayed at Oma Betty's house. I was so glad to see her [right, with Jasper]! And all my aunts, uncles, and cousins, too. Even Opa was there from Spain! They all gave me lots of attention and hugs and kisses, and it made me feel so comfortable that I never felt shy. We spent most of our 11 days in Vlissingen sitting around and talking. Well, the grownups talked, and I played with toys or watched DVDs. Or if my cousins were around, they played with me. Sometimes we took walks outside. The sun shone every day of our visit, but it was very cold, especially when it was windy. 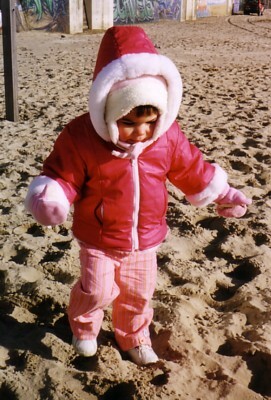 One day Mommy and Papa took me to the beach, but I had to wear all my warmest clothes, so I couldn't actually move very much [left]. Still, I liked walking in the sand, and Mommy helped me pick up shells. We also did a lot of shopping. We went grocery shopping for Dutch foods to take home. 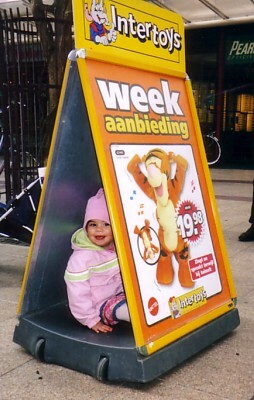 I liked Albert Heijn the best; one day soon after we arrived I fell asleep in the grocery cart at Aldi. We also shopped for souvenirs, especially Dutch children's books, DVDs, and computer games for me. Mommy also bought Jip en Janneke and Nijntje things, like puzzles and eating utensils, because you can only find those in Holland. Four days after we arrived, Mommy, Papa, and I moved to our own little home, “Apartement Martina,” for the rest of our stay. It was only 5 minutes' drive from Oma's house. It had two bedrooms (mine included a playpen for sleeping), a kitchen/sitting room, a newly remodeled bathroom, and, very important, heaters in every room. We ate breakfast there every morning, and I napped there each afternoon, and it was very comfortable and nice. There were many things to eat in Holland that I refused to taste, but I did find a few that I liked. Besides my old standbys of toast with jam, cereal, peanut butter on crackers, chicken nuggets, and an occasional banana, I ate a lot of patates frites (French fries), which the Dutch seem to serve with every dinner, kaas snacks, and yummy desserts. My favorite was chocolate vla [right], which I dubbed "choco-lala." Besides sitting, talking, and shopping, we did a few special activities while we were there. Our second night, there was a big party to celebrate Opa’s 75th birthday. Everyone went to dinner at a restaurant called Landlust. We all sat at a very long table, and Tante Greet's sister brought me a lunchbox full of small toys to play with, which made me happy. Mommy and Papa took me to Oma's at 7:30 so I could go to bed, and Oma's friend Odette babysat while they returned to the party. One day Tante Annemiek took me, Mommy, Papa, Maaike, Menno, Jasper, and Stijn to a very large swimming center in Domburg. There must have been four or five pools, some with slides and waterfalls. I liked them all except for the biggest slide, which scared me. We even ate a snack of patates frites in the café! 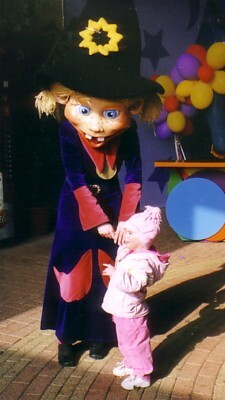 Another day, we drove to Venlo and met Tante Lianne and Christel at Toverland, an indoor amusement and theme park. I met the Toverland heks [left] and went on lots of rides. I liked the spinning teacups best, even though Mommy thought I would get too dizzy. I was too small for some rides, but others I liked were little cars on a track, a caterpillar train that Mommy sat in with me, a basket I sat in with Papa that went up and down and spun around, and a huge volcano to climb. It was very fun. The last night, we all went to De Wok for dinner, a special Asian restaurant. I didn't eat anything but patates frites (See? they're everywhere—even in Chinese restaurants) and ijs, but my cousins took me to a special play area for children. That was fun. I liked walking around Vlissingen. My favorite place was the Walstraat [right], an outdoor mall with lots of little shops and cafés. I liked to watch and listen to all the people. In Vlissingen, everyone speaks just like Papa, and I learned many new Dutch words to use when I got home. Our last day, March 7th, was long and difficult. 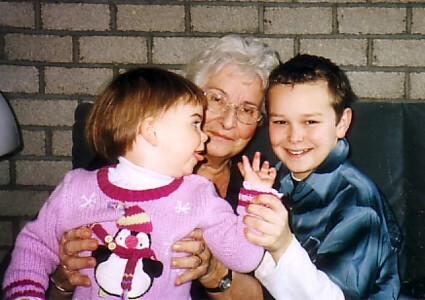 We got up early, said a last, quick goodbye to Oma, and then spent 3 hours in the car driving to the airport. I was really good in the car—truly—but after that I was tired of sitting. I didn't like the plane ride, and I tried to communicate that to Mommy and Papa as best I could. I slept two 45-minute naps, the second of which ended just as we landed in Seattle. I was still tired, so I started crying—and then I couldn't stop! I cried while we got off the plane... cried while we went through Immigration... cried while we went through Customs... cried all the way to our luggage. I think Mommy and Papa were very glad to get home. This year Easter fell on April 16th. The day before, Joseph went egg hunting at the park, but I wasn't feeling well, so I couldn't go. 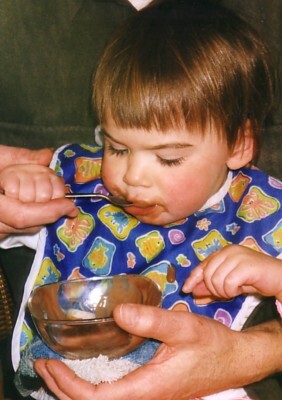 I did try dyeing Easter eggs with Cameron, but when I cracked my first egg (by rapping it against my highchair tray), Mommy asked me to watch rather than participate. 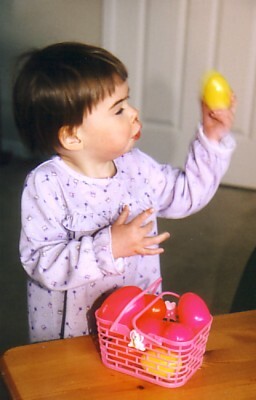 When I woke up Easter morning, the Easter bunny had hidden plastic eggs upstairs, and Mommy and Papa helped me search for them in my nightgown. I found every one and filled up a pink basket. The best part is that when I shook them, I could hear something inside [left], and when Papa helped me open them—Oooh!—we found small, solid chocolate eggs! Next, we went downstairs for breakfast, and there on the table were an Easter basket full of toys and candy just for me [right] and a soft white bunny as tall as I! 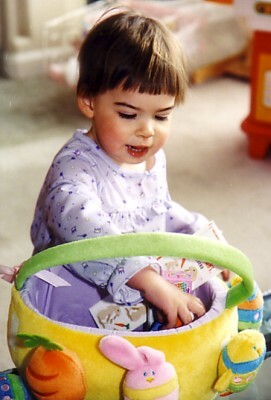 The basket contained a bunny I Spy book, three sheets of bunny stickers, Ernie and Elmo bath squirt toys, a frog bath toy attached to an egg filled with jelly beans, two plastic eggs filled with other Easter candies, and a 2-inch-tall chocolate bunny. Unfortunately, I didn't feel like eating the candy, but I liked the book a lot, and I hugged my new bunny friend and cuddled with him on the floor. I spent much of the day laying around watching Little Einsteins and Sesame Street on the TV 'cause I had a 100° fever and didn't have much energy. Grandma Joanie was supposed to come over for Easter lunch, but she couldn't because she had started chemotherapy and couldn't be around sick people. So Cameron and Mommy took lunch to her while I stayed home with Papa. After I had a good nap, Mommy, Papa, and I went to Grandpa’s house for dinner. 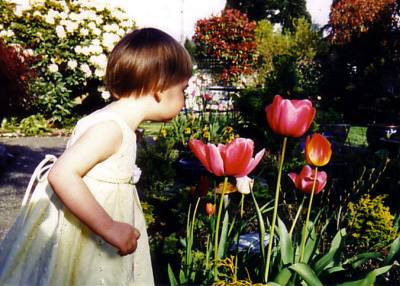 I wore my special yellow Easter dress with the purple flowers on the front. I don't remember what they served for dinner, but I know I didn't eat any of it. However, Aunt Kitty brought strawberry shortcake for dessert, and the vanilla ice cream tasted really good. Postscript: Three days later, when my fever had subsided but I still didn't feel well, Mommy and Papa took me to the doctor and found out that I had two ear infections! No wonder I didn't feel good for Easter!